A more upscale tavern-style American cuisine restaurant known for their burgers, Rare is the perfect place to have drinks with friends and enjoy appetizers and good burger. Located in the beautiful Affinia Shelburne Hotel on Lexington Ave and E. 37th Street, Rare is a happening spot on any day of the week. 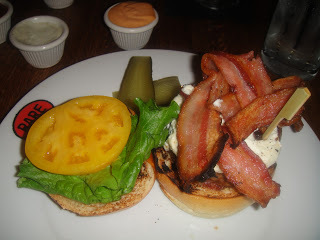 If you are familiar with my blog, you may know that my favorite food is a good burger. My expectations are sky-high when it comes to burgers because I’ve had some pretty amazing burgers in my life time. At Rare, they offer unique burger combinations, similar to Umami Burger in LA, but you are also able to create your own burger and subsitute items if you please. I went to Rare on a Sunday night at around 9:00pm, and it was very much alive and busy. I went with a big group of people and we got seated in the back of the restuarant in a more secluded private room. Although Rare offers other items on the menu besides burgers, everyone in my group order a different kind of burger. We also ordered the french fry trying basket for the table- with 3 different kinds of fries: sweet potato fries with a honey maple dip, parmesan truffle fries, and cottage fries (criss-cut fries) with spicy Mexican chipotle ketchup and spicy chipotle aoili. Fries are my absolute weakness so I enjoyed that lol. Rare is known for their “steakhouse burgers”, which you can choose from Rare’s ribeye, T-bone, Kobe beef, New York Strip, or Filet Mignon Patty melt. If you go to Rare, I suggest you order one of these steakhouse burgers because the meat is so much better than their regular burgers with normal ground beef. I ordered the Rare’s Ribeye burger, (Ribeye is my favorite steak), and I made my own burger with goat cheese, tomato, bacon, and a spicy chipotle aoili. It was very good. It wasn’t the best burger I ever had obviously because like I said, it’s hard to impress me with a burger because my expectations are so high, but I still enjoyed my burger a lot, no complaints. I especially loved all the options of sauce they give you for the burgers and fries. It was fun trying different dipping combos with all the flavors of sauces they had. We ordered fried oreos with strawberry and cinnamon ice cream for dessert which was exciting because it way my first time trying fried oreos! Heaven. Oreos are my favorite so it was the best dessert. For the chocolate lovers at the table we ordered a warm chocolate souffle cake too…yum! Great trendy spot in NYC if you are a burger lover. Not too expensive but still has an upscale feel to it. Rare on Lexington also has a Rare View Rooftop Garden with amazing city views of the Empire State Building, Grand Central Station and other midtown landmarks. There is also a Rare location in Chelsea, NY as well.